They might be the more prehistoric of the creatures out there in the world, but there is something amazingly modern about having a touch of roarsome in your kids' bedroom. Here at Wallsauce we are dedicated to inspiring people to make changes to their home with decorative wallpaper and interesting or unique bedroom ideas and it is no different when it comes to decorating a child’s room. So, if you want a little help on how to make a dinotastic space for your child to call their own, we have put together some of our ideas on how to create a roarsome dinosaur bedroom. Here at Wallsauce, as we have already mentioned we create high-quality wallpaper which is ideal if you are searching for something to help transform a room in your home. 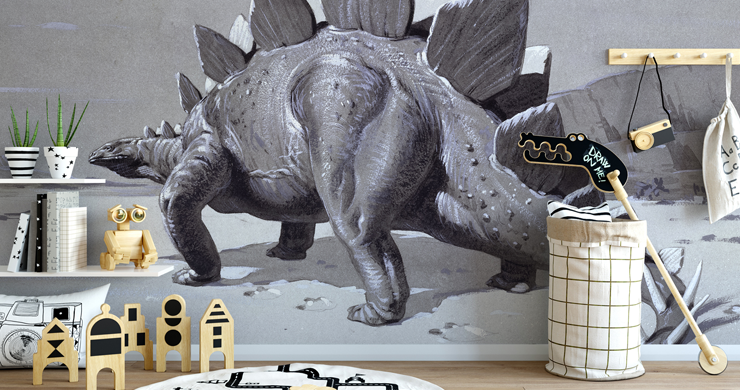 If it is your kid's room, then we have curated a dinosaur wallpaper range that could be just what you are looking for. We also have a wallpaper collection with the Natural History Museum, which is not only educational, but it is great fun too. Another popular dinosaur themed addition that you can make to a bedroom is dinosaur bedding. It used to be hard to find the right bedding for your child, but now, with the popularity of dinosaurs growing and growing, more and more stores are starting to add dino-themed bedding into their ranges. 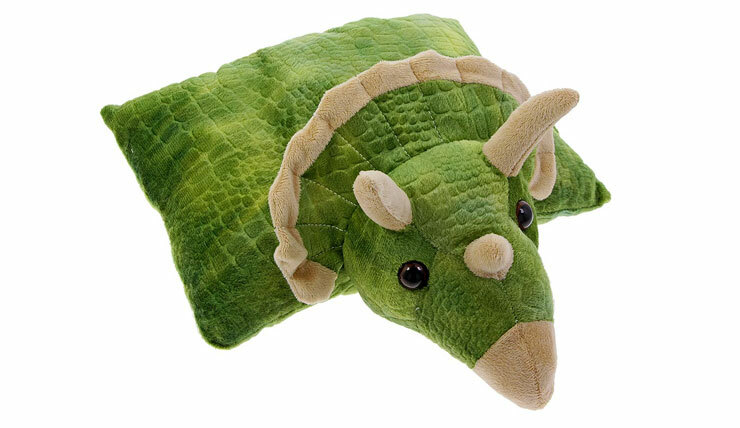 Green Triceratops travel cushion from the Natural History Museum shop. Not only is this ideal for your kids' room, but these designs are also bold and colourful which is going to brighten up their room too. Do you have a child who loves getting arty and crafty? Combine this passion for creativity with creating a dinosaur themed zone. 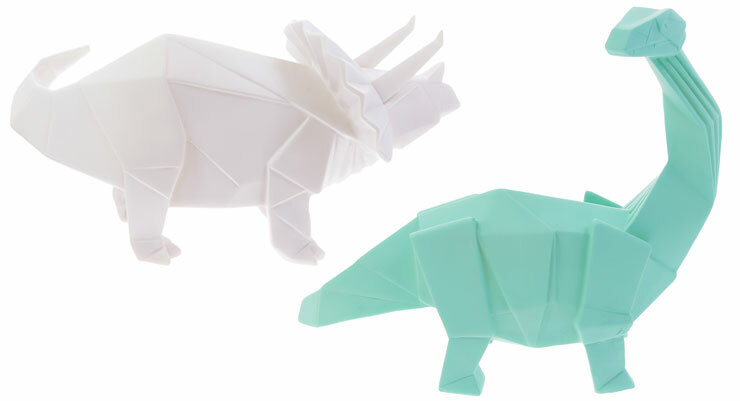 If you look on Pinterest, you will see a number of dinosaur crafts that you can try out for yourself at home. Not only does it mean that you have something to do on a rainy day, but it will also add to the overall theme of the room at a budget. Does your child have lots of dinosaur toys that they love nothing more than playing with? Growing tired of having to clean them up, only for them to get them back out again? 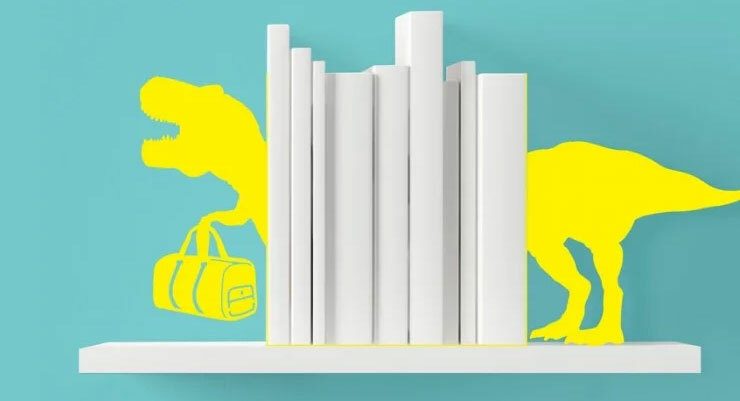 Why not work into your dinosaur themed bedroom some display shelves? T-Rex book ends from Redcandy. Not only is this a super stylish addition to the room, but it also helps you to tidy up their toys and keep things neat, one of the hardest things when it comes to putting together a kid’s room! 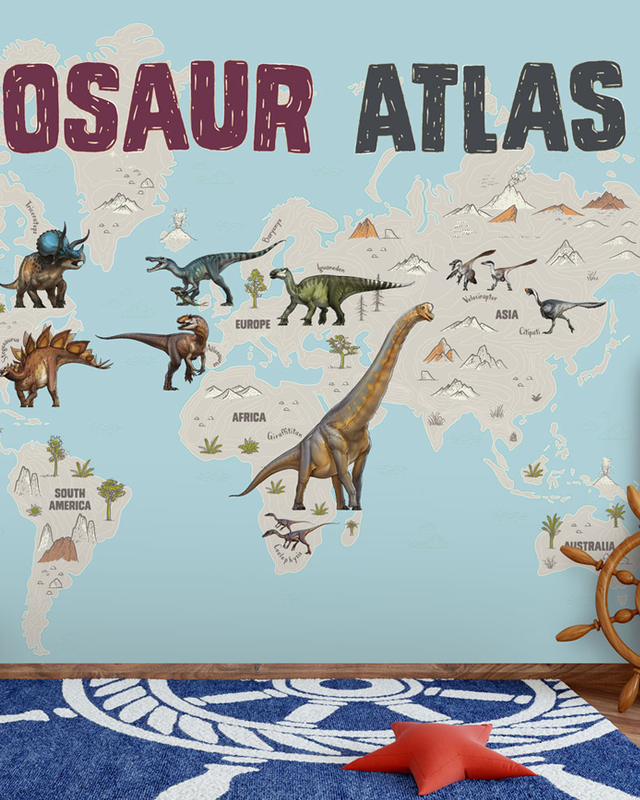 Whilst it is usually the younger children who are going to decide that they want a dinosaur themed bedroom, that doesn’t mean that the bigger kids out there are not going to love this particular style. You just might need to take a slightly older approach to things. Rather than bright and colourful reptiles that are going to bring a touch of the rainbow, you could actually add in more subtle touches. We have seen some great bone lamps out there, which have a skeleton of the dinosaur as a part of the stand. You can also try and source some replica fossils which are not only decorative, but that also add a touch of interest to your room too. Depending on how creative you are feeling, you could take your dinosaur themed bedroom a little further and actually create your child their very own cave. These can be made with cardboard or fabric, however, the idea is to allow them to have their own space which they can head into when they want some quiet time. The idea is that you make the cave snuggly and inviting, this could be full of cuddly toys and pillows or perhaps some of their toys. However, whatever you do, you can be sure that it is going to fit right in! One of the most important things in a kid’s room is to make sure that you have plenty of storage. After all, kids can be messy and despite being small, they have lots of stuff that you are going to need to tidy up. Thankfully, when creating a dino-themed bedroom, there are plenty of storage options that are not only going to help you to keep in with the overall theme but that are going to help keep the space neat and tidy too. You have bought the bedding, put up the dinosaur wallpaper and created a reading cave, you might think that your kid’s room is completely roartastic. However, have you considered those finishing touches that you could add into their room? Dinosaur lamps from the Natural History Museum shop. These prehistoric finishing touches come in a range of styles and types and it really depends on what you are looking for and the size of the room that you are redesigning. Some of the finishing touches that you can choose to add to your kid’s room include art prints, ornaments, cushions, even a pawprint rug or two. It is those finishing touches that are going to really bring the room to life and make sure that your little one loves nothing more than staying in there and calling it their own. It is no secret that decorating a kids room can difficult, especially if you want them to really love their space. However, we think that these great ideas will really help you to create a room that they will love to spend time in. If dinosaurs are not your thing, there are many more design ideas like magical unicorn bedrooms. What things do your kids love? What would they want to have in their bedroom? Please leave any comments in the box below.